It was curiosity born of happy childhood memories of Peek Freen’s biscuits that first led me to climb at The Arch. I have to confess I’d always been a bit sniffy about bouldering. It’s probably my age (just turned 47) but when I was learning to climb in the 1980s there were no indoor climbing walls and a trip out to the crags was made with the intention of making as much vertical progress as rope, fingers and skin allowed. A day’s clambering over boulders was a consolation prize taken only when the weather was too bad to attempt anything else. By the age of 19 I had developed a serious crag habit. I was leading my first HVSs and thinking that the sky was the limit. Then out of the blue I was diagnosed with a degenerative eye disease and told that I could expect to be fully blind by 30. My life went into free fall and after a brief struggle (ending with a nasty unprotected fall) I’d hung up my harness and begun a two-decade battle with my craving to climb. Writer and climber Al Alvarez calls it ‘feeding the rat’, a gnawing compulsion in some of us to push ourselves to the limits of our endurance. Starved of action my rat was eating me up. I ached to climb and Pilates was no substitute. I had tried a couple of climbing walls during the 1990s when they first came to the UK but they didn’t feed my need to get high at the end of a rope. So I wasn’t expecting much when in 2009 my daughter decided she wanted her birthday party to be at our local wall in North London. How wrong could I have been?! While other parents were ogling the buff-body instructors I was checking out the bumps and curves of the top roped high walls, and I was hooked again. I quickly discovered that climbing instructors, like climbers the world over, are born problem solvers. My blindness wasn’t a barrier, merely a hurdle to be worked round. As the weeks and months passed my confidence returned and the prospect of getting back out onto real rock seemed less absurd. One day as I lay gasping but jubilant having cracked a tricky overhanging problem I let slip my teenage dream of climbing The Old Man of Hoy, a 450ft sandstone pinnacle in The Orkneys. In his calm considered way my instructor rubbed his chin and said ‘well with a bit of work you could probably manage it’. 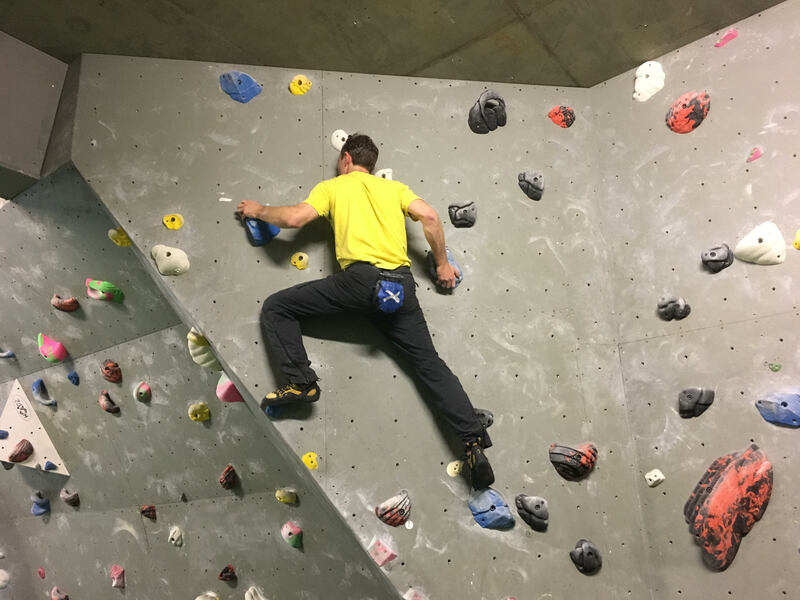 A bit of work turned out to be a brutal climbing fitness regime that saw me lose 12 kilos and gain the ability to hang from one arm like a chimp. By now I had acquired a climbing partner, Matthew, and he and I trained two to three times a week with a new instructor called Andres. We spent weeks perfecting a clock-face system so that they could accurately direct me to my next hand or foothold. But it soon became clear that top-roping had its limitations as far as teaching was concerned. The distance between climber and belayer makes communications difficult and the higher the climber goes the less easy it is for the belayer accurately to judge distances between climber and holds, to spot useful features and even to be heard. Frustration was setting in and we needed a solution. That turned out to be bouldering. By now it was 2012 and Andres was ravsing about this amazing new climbing centre in Bermondsey called ‘The Biscuit Factory’. When I learned that it was on the old Peek Freen’s site and therefore the home not only of the Garibaldi and Bourbon biscuits but of Twiglets too!, I decided to eat my words and give bouldering another go. Biscuit production may have ceased long ago but the emphasis on ‘virtuous activity’ to improve the health of those labouring within the building (which made the factory owners pioneers in Victorian England) remains. On a series of cleverly designed and well-maintained routes I quickly discovered that there is no better way to improve climbing stamina and technique than bouldering. Because the spotter is that much closer to the climber it’s easier for him/her to direct and correct their movements – and all without the need to shout to be heard. Without the security of a rope precise footwork becomes essential and because the routes are shorter they tend to be more technical and often designed to focus on one specific climbing skill. Matthew, Andres and I found ourselves returning to work on problems that exposed my weak areas – rockovers and laybacking – and enjoying the progress we all made up through the grades. My footwork and my ability to crimp on seemingly impossible slopers grew as did my confidence and, when it did go wrong I learned how to take a fall safely (which is really quite terrifying when you can’t see what’s below you). In 2013 I became the first blind person to climb The Old Man of Hoy. The ascent was filmed by BBC Scotland and aired on The Adventure Show. I have since published a book detailing the background to the climb and how the camaraderie I rediscovered in the climbing community and the spirit of the London Paralympics helped me scale heights I thought were lost to me forever. As a result of all the publicity an old school friend, Carl, who I hadn’t seen for twenty years got back in touch. Another keen climber he lives round the corner from The Biscuit Factory and so we meet up two or three times a month to climb there together. And then last year The Arch North opened just up the road from me in Burnt Oak so that Matthew, Andres and I now get together every Friday afternoon for a three-hour session followed by a pint or two. We still try and get outdoors as often as possible and I’ve even started to lead on sport routes up to F6a (learning to fall indoors has proved invaluable!). 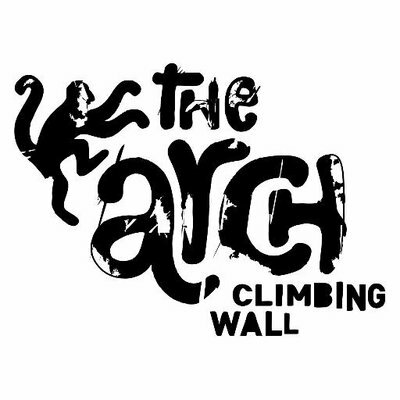 We do still go to the top-roped wall we started at but as the three of us prepare for a trip to the sharp, white limestone fo Southern Sardinia this month it’s the edgy little yellow V3s and V4s at The Arch North that we’re concentrating on.